Pope Francis has reiterated his position to open the secret Vatican archives covering the period of World War II to allow researchers to assess the role played by Pope Pius XII during the Holocaust. In an extensive interview with the Israeli newspaper 'Yediot Ahronot', Francis said there was "an agreement between the Vatican and Italy from 1929 that prevents us from opening the archives to researchers at this point in time. But because of the time that has passed since World War II, I see no problem with opening the archives the moment we sort out the legal and bureaucratic matters." The pope expressed worries that the current debate about Pius XII was not fair. "One thing worries me, and I'll be honest with you – the image of Pope Pius XII. Ever since Rolf Hochhuth wrote the play The Deputy in 1963, poor Pope Pius XII has been accused of all sorts of things (including having been aware of the extermination of the Jews and doing nothing). I'm not saying he didn't make mistakes. He made a few. I get things wrong often too. But prior to the release of the play, he was considered a big defender of the Jews. "During the Holocaust, Pius gave refuge to many Jews in monasteries in Italy. In the Pope's bed at Castel Gandolfo, 42 small children were born to couples who found refuge there from the Nazis. These are things that people don't know. When Pius XII died, Golda Meir sent a letter that read: 'We share in the pain of humanity. When the Holocaust befell our people, the Pope spoke out for the victims.' But then along came this theater performance, and everyone turned their backs on Pius XII. "Did Pius XII remain silent in the face of the extermination of the Jews? Did he say all he should have said? We will have to open the archives to know exactly what happened. But to judge the actions, we will also need to understand the circumstances under which he was acting: Perhaps it was better for him to remain silent because had he spoken, more Jews would have been murdered? Or maybe the other way around? 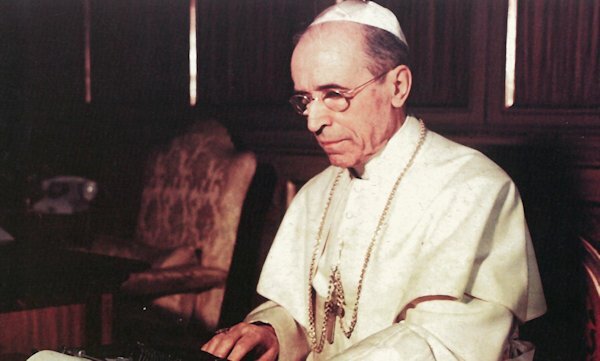 I don't want to sound petty, but it really gets my goat when I see that everyone is against the Church, against Pius XII – all those detractors. "And what about the Allies during the war? After all, they were well aware of what was going on in the death camps and they were very familiar with the railroad tracks that led Jews to Auschwitz. They had aerial photographs. And they didn't bomb those tracks. I'll leave that question hanging in the air, and say only that one needs to be very fair in these things."